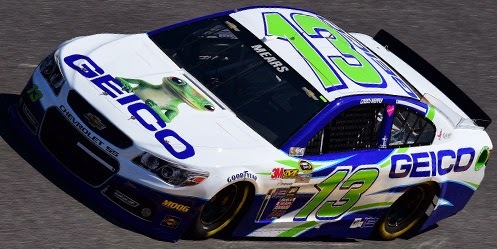 Casey Mears finished last in Thursday’s Budweiser Duel #1 at the Daytona International Speedway when his #13 GEICO Chevrolet lost the engine after 17 of 60 laps. A year ago, in Duel Race #2, Mears was in danger of missing the 500 field for the second time in four years. Alone and out-of-touch with the rest of the pack after a late-race miscue, Mears suddenly saw a huge wreck unfold, sending Clint Bowyer’s Toyota high into the air. The wreck jumped Mears to the 14th position, locking him into Sunday’s show. A 10th-place finish in the 2014 Daytona 500 was followed by a 14th at Phoenix that put him 10th in points, but even with just one DNF by season’s end, he’d slipped to 26th in the standings with just 3 Top Tens and a season-best 4th in the rain-shortened July race at Daytona. For 2015, Mears brought his familiar white and blue #13 Chevrolet to the track, but only managed 33rd-fastest in Sunday’s qualifying session. Through the week, he’d timed in 30th in the opening practice, improved to 17th in the second, then 8th of 44 in the third on Wednesday. He ran just two laps in the fourth session Wednesday afternoon, ranking 22nd of 32, then passed on the next session to prepare for Duel Race #1 the next day. At the start of Thursday’s race, the three backup cars driven by Clint Bowyer, Michael Annett, and J.J. Yeley briefly traded the last spot before conceding it to Ron Hornaday, Jr., who by Lap 6 had fallen nine seconds behind the rest of the field. Hornaday, looking to make his first Cup start since the 2003 finale at Homestead and his first Daytona 500 start since 2001, was running his first competitive laps in the #30 Smokey Mountain Herbal Snuff Chevrolet. The car was owned by Curtis Key, who had struggled in recent years to make ends meet in his XFINITY (formerly Nationwide) Series team, often fielding a number of “start-and-park” entries to fund the primary #40. In the Duel race, as in practice, Hornaday struggled to find speed and, by Lap 6, had completely lost touch with the rest of the field. On Lap 18, he was in position to lose a lap to race leader Trevor Bayne when trouble broke out in Turn 1. Mears, who was running three-wide in the high lane in 11th, lost the motor, spewing oil onto the nose of Tony Stewart’s #14. As the caution fell, Mears managed to get to the inside safely, averting what could easily have been a multi-car pileup. The caution, the first of the night, allowed the leaders to pit, but sent Mears to the garage area and out of the race. The first crash of the evening began to fill the rest of the Bottom Five. On Lap 28, Johnny Sauter, who was 13th-fastest Sunday in BK Racing’s #83 Dustless Blasting Toyota, crossed the nose of A.J. Allmendinger’s #47 Kroger / USO Chevrolet coming off Turn 4, sending Sauter’s car sliding the infield grass and ripping away the #83's front splitter. Allmendinger, who had avoided practice for most of the week in hopes of avoiding this very scenario, found himself on the hook with the right-front torn up. 22nd-place Trevor Bayne, in his second appearance driving the #6 AdvoCare Ford for Roush-Fenway Racing, was responsible for the first lead change of the day when he passed Matt Kenseth on Lap 18. On Lap 53, however, he also brought out the final caution when he spun in the high lane in Turn 1, collecting Kyle Larson and Ty Dillon in the process. Bayne managed to stay on the lead lap, but still finished one spot behind Hornaday, who was the only member of the Bottom Five to miss the field for the Daytona 500. Johnny Sauter, meanwhile, still secured the 36th spot in the 500 based on his qualifying speed, locking him into his first Daytona 500 since 2007, when he came home 16th in the #70 Yellow Transportation / HAAS Chevrolet for owner Gene Haas. It will be Sauter’s first Cup start since last August at Pocono, when he finished last for BK Racing driving the team’s 2014 LASTCAR Cup Owner’s Champion #93 Dr. Pepper Toyota. Joining Sauter among the night’s underdog stories was 9th-place Landon Cassill, who for the second-straight season squeaked his way into the 500 field driving the #40 Carsforsale.com Chevrolet for Mike Hillman. Cassill, who drove an unsponsored Hillman car to a 4th-place run last fall at Talladega, earned his first top-five finish in the series that day and seeks another on Sunday from the 17th position. 10th-place Cole Whitt, making his debut with Front Row Motorsports, threatened to finish in the Top Five during the Duel’s second half, indicating he would hardly need the owner points afforded him in a trade with teammate and past Daytona winner David Ragan. Whitt, who endured a difficult rookie season in 2014 following the collapse of Swan Racing and move to BK Racing, will make his second 500 start on Sunday. Ragan, who needed to race his way into the 500, did so by the narrowest of margins, recovering from a mid-race crash in Duel #2. Ragan will roll out 28th, Whitt in 19th. Finishing 12th was Michael McDowell, who after narrowly missing the 2014 field raced his way into the 500, giving the #95 Leavine Family Racing team its first 500 start since 2013. It was during that same 2013 race that McDowell, then driving the same Phil Parsons entry driven Thursday by Wise, earned his first career top-ten finish, finishing 9th. Sunday will be McDowell’s fourth start in the 500, following up a surprising 7th in the rain-shortened July race last year. He will start 23rd. One spot behind McDowell - both in the 2013 Daytona 500 and in the Duel race on Thursday - was J.J. Yeley, who locked-in a backup car from BK Racing. Yeley’s #23 MAXIM Fantasy App / Dr. Pepper Toyota showed speed in Sunday’s qualifying session, briefly running as high as 3rd, but suffered right-side damage in the controversial crash between Clint Bowyer and Reed Sorenson, forcing him to a backup as well. Yeley will now make his first 500 start since the 2013 running and take the green in 25th. Following Yeley to the finish line in 14th was Michael Annett, who will also make his first start of the season in a backup car. Making the move from a rookie season with Tommy Baldwin Racing to a sophomore at HScott Motorsports’ new second team, Annett faced a setback Wednesday when his #46 Pilot / Flying J Chevrolet wrecked after Danica Patrick tangled with Denny Hamlin entering Turn 4. Annett will now make his second-straight start in the 500, and the first for the #46 since 2011, rolling out 27th. And, when the dust settled on the two races, Mears secured the 41st starting spot for Sunday’s Daytona 500. *This was Mears’ second last-place finish in the Budweiser Duel, making him the only two-time last-place finisher of the event among active drivers. His other finish came in 2011, when he also lost the engine on what was then Germain Racing’s #13 GEICO Toyota after only 2 laps. Unlike Thursday’s race, that last-place finish cost Mears a start in the Daytona 500. *This is the first last-place finish by a Chevrolet in either of the Budweiser Duel races since 2009, when Mike Skinner’s #23 Mahindra Tractors Chevrolet fielded by R3 Motorsports lost oil pressure after he completed 23 laps of Duel Race #1.